We are a credible Supplier of Amree Plus Granules in India. Our Amree Plus Granules is a comprehensive oral anti-hyperglycemic for the management of Diabetes Mellitus. These granules also help in delaying triopathic complications associated with diabetes. The Amree Plus Granules are a synergistic mix of active constituents of the natural herbs. They provide benefits of w.r.t. glucose metabolism, insulin production and utilization, lipids metabolism. The granules also alleviate the symptoms like fatigue, weight loss, excessive thirst etc. Dosage : Should be taken about Â½ hr before meals with water initially along with the recommended allopathic drugs. It Delays the absorption of glucose from gastro-intestinal tract due to the soluble dietary fiberspresent in its ingredients. It exhibits inhibitory action against glucose uptake in small intestine of experimental subjects. Amree Plus also suppresses selectively neural response of sweet taste stimuli on tongue. It activates the liver for effective glucose and lipid metabolism. Bio-chemical studies suggest that Amree Plus increases sensitivity to insulin. It provides essential nutrients for the well being of diabetics like bioflavonoids, glycosides, tannins, several micronutrients etc. Checks over fatigue , excessive thirst and urination. Should start Amree Plus in dosage 1/3-1/2 teaspoonful (2- 3 gms) twice or thrice a day, preferably 1/2 hr. before meals. Periodically check the blood sugar and follow the diet routine & life style as recommended by physician. 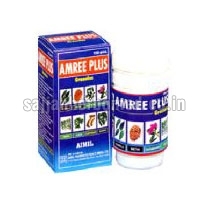 Start Amree Plus in dosage of 1/2 teaspoonful (3 gms) twice or thrice a day, before meals initially along with recommended allopathic medicines if any. Periodically check the blood sugar and observing anti-hyperglycaemic response, gradually lower the dosage of allopathic medicines till completely withdrawn. Should follow the dietary recommendations & life style advisable for diabetics & consult the physician.